Turn AppleScript apps into background apps. Is there a better alternative to Script Backgrounder? Is Script Backgrounder really the best app in AppleScript category? Will Script Backgrounder work good on macOS 10.13.4? Turn to Script Backgrounder when you need an AppleScript application* to run in the background. That's to say, not to appear in the Dock or in the Force Quit menu. 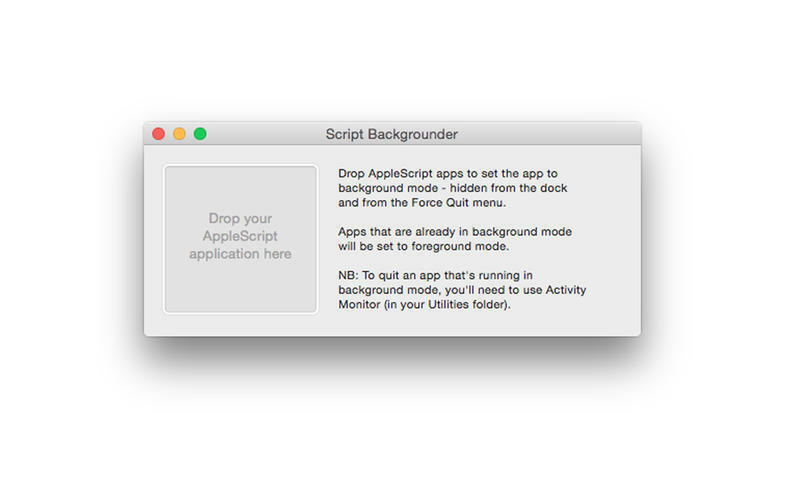 You can use Script Backgrounder to change your AppleScript applications into background apps. Simply drop your app onto the drop area. Normal apps will be turned into background apps. Background apps will be turned back into foreground apps. Note to quit apps running in the background, you'll need to use Activity Monitor to find your app and quit it. Script Backgrounder needs a review. Be the first to review this app and get the discussion started!